The Foo Fighters are one of my favourite rock bands of all time, however when it comes to their albums, often times as a complete package they fall slightly short. With 'Wasting Light' however, this is most definitely not the case. This album is extremely underrated in terms of what it offers to rock music in the modern era, and fans of rock music who are living through the "death of rock music", should definitely give this album a chance. One of Dave Grohl's best works in a long time. 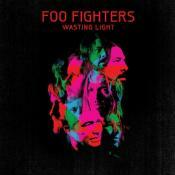 Wasting Light is pure and unadulterated Rock and Roll. Foo Fighters returned with a more raw sound through analog recording techniques, making for a very powerful and rocking record. Most of the songs are anthemic arena rockers, and function well for what they are. It’s nothing necessarily groundbreaking, but it’s fantastically executed rock music. This album is very enjoyable. One of Foo Fighters finest albums, bringing in the over-the-top rock and roll swagger of yesteryear, to the polish, grit and fun of more modern rock staples, creating a fun as hell and refreshingly creative album from one of rocks loudest voices (Both literally and figuratively). A big step-up from Echoes and an unbelievably solid record. The Foo Fighters' best album since their 90s heyday. They have finally found themselves having fun and playing around with all sounds. For me it was on top 10 of the year.